Fashion Law is an emerging and exciting field for both lawyers, law students and fashion industry professionals alike. However, what I observe is that there seems to be a challenge and disconnection within the legal industry in clearly understanding the difference when communicating about fashion law to legal colleagues; versus the actual clients/potential clients in the fashion industry who need legal services. However, there seems to finally be an effort and positive move in bridging this gap, by directly connecting with the fashion client/potential client/ designer on both the business of fashion and fashion law; with the launch of the recently released ‘The American Bar Association’s Legal Guide to Fashion Design’ book edited by Attorney David H. Faux. The book is a collaborative effort by ten (10) attorneys and two non-attorneys that looks at the business of fashion through the eye of the fashion designer; almost as you would a documentary; and provides legal insight and valuable information on how to handle the various legal issues that the designer will or does encounter. The book is probably the first book I have read on fashion law which is clear it is written “by lawyers for non-lawyers,” and lives up to its promise. Consisting of only 211 pages, the softbound book with a very simple design aesthetic, reads quickly, and has a “hold my hands” very practical approach in its delivery of its content. The book begins its chapter by walking the designer through the importance of trademark protection, then it addresses brand protection, fashion and copyright law, design patent, internet law, incorporation, fashion financing, employment law, the legalities of the runway, manufacturing and ultimately concludes with its chapter on fashion licensing. What I like about each topic area addressed is that it is not a recitation of boilerplate law that could easily miss the mark with the designer it targets. Instead, it is an almost personal, yet straight to the point and very easy to understand discussion on the issues that are all too common in the life of a fashion designer. As an aspiring designer who also studied fashion, I felt that if I had no clue about the law, I could read this book and gain the confidence I needed to start my fashion line, make sure I have the necessary and basic infrastructure in place and of course secure the right attorney to help me with executing the legal aspects of my fashion business. In the ‘Fashion Financing’ chapter, for example, the book gave a nice and much needed focus on ‘factoring,’ a topic that is rarely ever discussed in the few fashion law books I have read so far but is critical to a designer’s success. The chapter also takes the designer through the perspective of a bank and why factoring would and is usually the option many designers opt for. I also liked the straightforward explanation in other chapters. For example, on the fashion event production/ ‘Legalities of the Runway’ chapter, designers, you will be glad to know that the book explains what goes into showing at a fashion show, and also provides a simple sample model release agreement for easy reference. Fashion photographers, you will also appreciate the model release agreement in case you work with independent fashion models. Designers, if you have never manufactured an apparel product in your life and are clueless where to start, the chapter on ‘Manufacturing’ (chapter 10) walks you through the process. It also explains the legal pitfalls to avoid; and provides a sample ‘Code of Conduct for Factories’ as well as a manufacturing agreement. Indeed, throughout the book, the reader is never left guessing or trying to visualize what the legal concepts discussed in the book look like. This is because there are sample forms and agreements, and even a CD with all the basics you need for your fashion startups or existing design businesses. I also thought it was neat and interesting that the authors/publishers left some blank pages at the end of this very easy to digest book so you can jot down your notes. There is also a simple index that allows for quick and easy navigating. In short, this is a friendly, absolutely non-intimidating book that breaks down legal concepts in basic English and in a very conversational tone. It is also a book that understands fashion law is very much about the attorneys serving the industry professional, and keeps its eye focused on that goal. Indeed, when I received my review copy of the book from the publisher, and I scanned through the table of contents and read the first page of the introduction chapter, I knew I would enjoy reading it. I did. 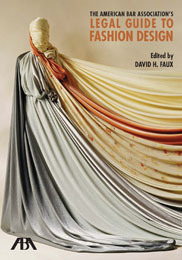 Accordingly, I highly recommend ‘The American Bar Association’s Legal Guide to Fashion Design’ Edited by David H. Faux to all fashion designers and/or those interested in the business of fashion. Editor: David H. Faux, Esq.